Age: 15 Birthday: Sometime in the Fall Eye colour: Brown Hair: Black Height: 157.5 cm (5'1") Weight: 49 kg The female protagonist and a third year middle school student. In the tradition of many Rumiko Takahashi heroines (Lum, Akane Tendo, Kyoko Otonashi), Kagome can be extremely sweet, but can also become very dangerous when provoked. InuYasha wears a special bead necklace (known as the Beads of Subjugation) which only responds to Kagome's command: when she yells "Sit!" ("Osuwari!") (Often "Sit, boy!" in the dub) InuYasha is thrown to the ground. The necklace was placed upon him due to his dangerous attitude when he was unsealed. 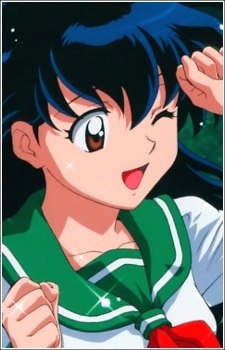 As the series continues, Kagome uses the necklace less and less. It is scarcely used by this point in time, and is purely comedic relief when it is. She is the reincarnation of a priestess 50 years ago, named Kikyo, the previous protector of the shikon no tama. As fate would have it, Kagome also develops feelings of strong love for InuYasha. This relationship proves to be a driving point of the series. In the series, Kagome becomes a powerful miko (not really a miko).